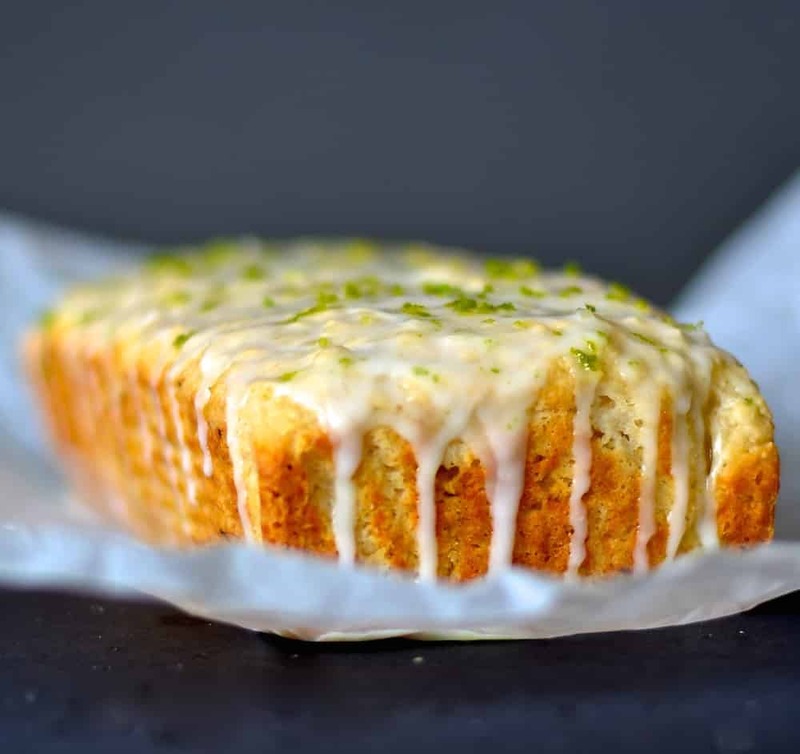 Citrus and tropical flavours combine in this light & delicious Coconut Lime Cake with a sticky, zesty glaze. Lime and coconut are two of my favourite flavours and they come together perfectly in this delightfully sticky and zesty Coconut Lime Cake. I love zingy, fresh flavours, as you can probably tell from the number of citrus recipes I have here on AVV. From deliciously sweet like my Sticky Orange Olive Oil Baked Donuts, to savoury in my Loaded Taco Fries with Lime Crema, there is something for everyone. I can never resist a bargain and when I saw great big nets of limes at two for $5.00 I had to have them. 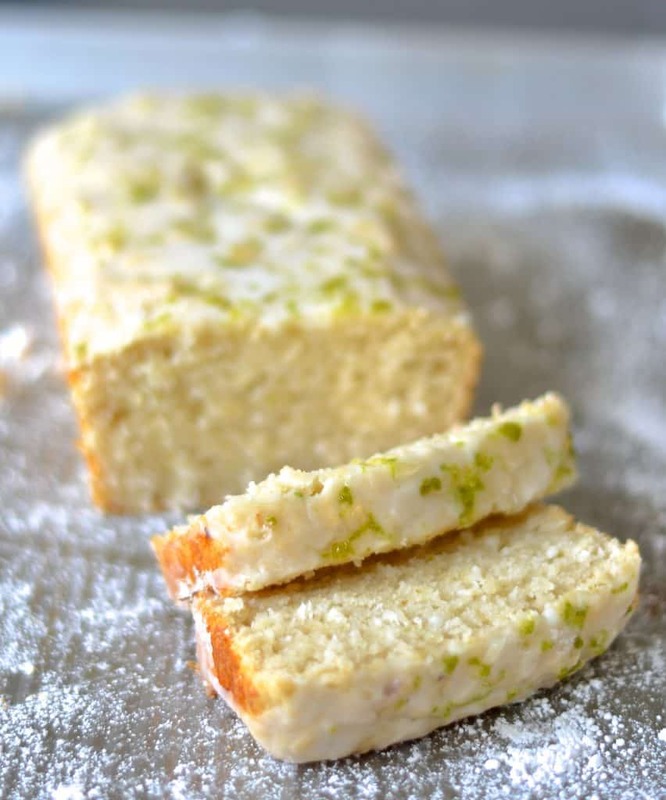 Along with lots of gin and tonics, we have been eating plenty of this Coconut Lime Cake. The tropical flavours bring back welcome memories of summer which, after the recent storms here, feels like a lifetime ago. 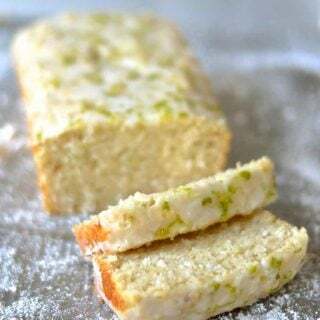 The tender lime sponge is full of citrus flavour and heavily flecked with shredded coconut which lends a slightly chewy texture. Top that with an extra pop of flavour from the zesty, sticky lime glaze and you will be in tropical heaven! Limes have a multitude of health benefits. Just one lime has around twenty-two milligrams of calcium and five milligrams of folate. They are also known to be anti-carcinogenic, help prevent kidney stones, lower cholesterol and combat aging skin. All great reasons to make and eat this Coconut Lime Cake! Please leave your feedback below when you make this cake. I love to hear what you think! You can also share your pictures on Instagram or Twitter. I am @avirtualvegan. Use the #avirtualvegan on Instagram so I don’t miss them. Citrus and tropical flavours combine in this light & delicious Lime & Coconut Cake with a sticky, zesty glaze. Add all the wet ingredients to a bowl or jug and mix well. Add all the dry ingredients to a mixing bowl and stir to combine. Add the wet mixture to the dry mixture and stir until just combined. DO NOT over mix. Just mix until you cannot see any dry bits of flour. Work quickly. You will start to see bubbles forming as you mix and the quicker you get it in the oven the better the cake will be. Place in the centre of your oven and bake for 40 - 50 mins or until a toothpick or skewer inserted into the centre comes out clean. Add lime juice 1 tablespoon at a time, stirring well between each addition. You won't need as much as you think you will. Stop when you have a thickish, but pourable icing. If you add too much lime juice just add a little more powdered sugar. Pour the icing over the top of the cooled cake. It looks good when you let it run down the side in little streams. Grate a little lime zest on the top to add a pop of colour! Googled for vegetarian like recipes, andi this, I knew I had to make it. It’s in the oven now, and smells SO GOOD!! Awesome Ruth. I hope you enjoy it! We love this cake. I’ve been making it for ages and kept meaning to come and leave a comment here but did not get around to it until now. Perfect recipe. Lovely flavours and so light and fluffy. Thank you! I made this cake twice, it did not rise and is very heavy and thin. There was No bubbling and I did what the recipe says. it tastes good but its frustrating! Hi John. Sorry you are having issues with it. It’s a cake that I make frequently myself and until your comment it’s never had any negative feedback. Funnily enough someone shared a pic of it after they made it on Instagram today and it looked perfect and they loved it. Are you absolutely sure you are following the recipe exactly? If you do there is no reason it would not work. There is so much acid in it (from the lime juice and vinegar), that it really can’t fail to react with the baking soda and cause bubbles and rise. Have you definitely added baking soda AND baking powder each time at the quantity stated, and tested them to make sure they are actually working? Sometimes if they have been open for a while or if they are past their use by date, they don’t work well. Also it is very important with this cake to get it in the oven as soon as you have mixed everything together and before the baking soda/acid reaction finishes. I just looked and I have everything I need to make this but I don’t have any apple cider vinegar. Is this necessary? An acid like vinegar is necessary in a lot of vegan cakes because it reacts with the baking soda and causes the rise. I think in this one if you omit it you will still get an ok result though because of all the lime juice. Maybe add an extra tablespoon of the lime juice to compensate a bit. Hope that helps! The liquid comes from the lime juice (there’s half a cup), liquid coconut oil and apple sauce. It doesn’t need any milk of any kind. It’s quite a thick batter but it won’t be dry. Hope that helps! Great combination of flavours. I can’t resist a lime glaze – yum. There isn’t really a sub for the apple sauce in this cake. Mashed banana would work but the flavour of the banana would ruin the nice lime flavour. All is not lost though! Make your own apple sauce. It’s so easy and takes no time at all. Just peel and core some apples. If you are in the UK use cooking apples. If not any apples will do. I’m not sure how many you will need to get 3/4 of a cup of sauce, perhaps 5 regular eating apples, or 2 -3 cooking apples as they tend to be quite large. I so miss them as you can’t get them here in Canada! If you end up with too much it freezes well or you can throw it in a smoothie or some oatmeal ( or make another cake)! Chop them and throw them in a pan with a couple of tablespoons of water. Cook over a medium heat until soft (about 10 – 15 mins) Some apples stay a little hard when you cook them like this but don’t worry as you blend it anyway. Throw everything in a blender or food processor and blitz until smooth. If you have used English cooking apples you will probably be able to skip the blending as they break down to a purse anyway. Then you will have apple sauce. It will keep in the fridge for up to a week in a sealed container. Is there any reason I couldn’t bake this cake as cupcakes? I have never cooked it that way but there is no reason at all it wouldn’t work. You will need to adjust the cooking time but that will be the only difference. I would imagine about 20 minutes – 25 minutes. Check that a toothpick or skewer comes out clean before you remove them. They will make great cupcakes! Don’t you just love it when you see a recipe you like and have all the ingredients! It doesn’t happen often. You making this cake was obviously meant to be! Enjoy Angela ? I am glad you like my recipe. Coconut is just a fantastic ingredient. It’s so versatile and is wonderful in this cake both for taste and texture. I hope you enjoy it ! looks amazing! any apple sauce replacements? The apple sauce replaces the eggs and means you can use less fat in the cake. I haven’t tried it with any thing other than apple sauce but pear purée might work as that has a very mild flavour .Banana would probably work too but the flavour would no doubt come through. If you can use apple sauce it would certainly give the best result. It is easy to make yourself if you have some apples lying around. Peel and core them and put them in a pan with 2 -3 tablespoons of water and cook down until soft. If they are harder type apples that don’t go soft easily just purée it after in a blender, food processor or with a stick blender. My word this looks tasty! I love lime and I love coconut, but most of all I love them together! haha! Thanks Jared! Lime & coconut are a match made in heaven! Thank you for the lovely comment & the song! ? Thanks Mae! Good to hear that you are trying out some vegan recipes and what a great friend you are to do that! You really won’t miss the egg and butter in this recipe. It’s so good! I do try to limit the more unusual ingredients but sometimes they are necessary to get a good result. In most traditional vegan cakes you would use flax or chia in place of the egg but luckily in this cake the acid and the baking soda / powder do all the work!